Today’s post is a prequel, of sorts, to my next recipe. I can’t tell you what that will be, but it will involve today’s all-natural DIY sweetener (hint: it has something to do with… COOKIES COOKIES COOKIES!). All right, there you have it, I guess I’m too excited to keep it a secret! Date paste is my new favorite sweetener to use in baking, and I’ve been experimenting with some recipes to see how it stacks up against my usual go-to sweeteners, honey and maple syrup. So far, I’m impressed! What I love about this homemade sweetener is that it is only two ingredients: water and whole dates. Date paste is also great because it can take the place of eggs and/or butter in vegan recipes and results in a deliciously moist baked good. Dates have a natural caramel-like flavor (as you may remember from my healthy caramel dip) that lends a nice quality to baked treats, especially cookies. Dates have natural sugars (of course) but they also have fiber, vitamins, and minerals… nutrients you’re not going to find in most sweeteners. Dates are especially high in iron, potassium, calcium, manganese, and copper. They’re a great energy booster, an easily recognizable and digestible fuel for your body. I use dates on a regular basis, usually to sweeten smoothies, raw puddings, and porridge (like my pumpkin pie buckwheat porridge). In order to use dates to sweeten your baked goods, you first have to blend them into a more workable form. Date paste can also be stirred into oatmeal or other warm cereals to sweeten them. Date Paste can be purchased at health food stores, but making it is really easy, and you’ll probably save some money. You can use date paste in cake, muffin, and cookie recipes in place of other liquid sweeteners, but it may take some trial and error. Start by replacing other liquid sweeteners with date paste in equal amounts, and then add a little more date paste or extra liquid as needed. 1. Begin by soaking your dates in enough hot water to just cover them (I usually heat some water in the kettle, and then let it cool, before pouring over my dates). I usually soak anywhere from 20 minutes to an hour, depending on how dry/hard your dates started out. I’ve also forgot about my dates and soaked them 2 hours, and they turned out fine! 2. Drain the dates and catch the soaking water, which you’ll want to save. Place dates in your food processor (you can use a blender, but you’ll need to use more water, resulting in a thinner/less-sweet paste). Add a couple of tablespoons of the soaking liquid. Process for a few minutes, scraping the sides as needed, until smooth, and adding a couple more tablespoons of soaking liquid if needed. I used about 1/4 cup of soaking liquid total. 3. Store in the refrigerator. This should stay good for a least a few weeks, or you can even freeze it for longer periods of time. Mine never lasts too long though! What is your favorite natural sweetener? 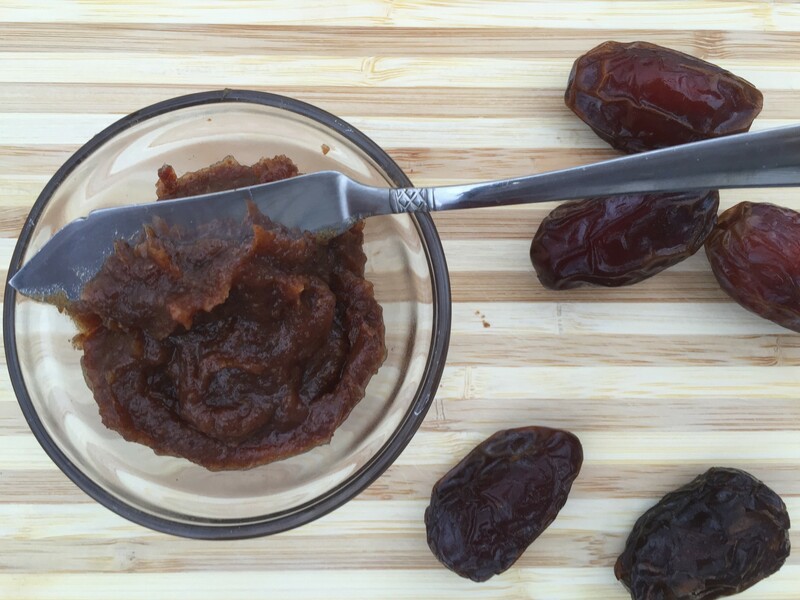 Have you ever made date paste? Let me know in the comments section if you give it a try!